How do I Clean a Maytag Washing Machine Filter? Do Washing Machines Have a Lint Trap? No matter how stylish the garment, excessive lint detracts from the beauty of any piece of clothing. Lint traps and filters help prevent this from occurring – ensuring that each garment you retrieve from the washing machine is clean and lint free. Lint traps have long been a staple of dryers everywhere, but some manufacturers also install lint traps in washing machines. A washing machine lint trap not only prevents lint buildup on your clothing but also protects you from possible drainage issues. Towels are a common source of washing machine lint. 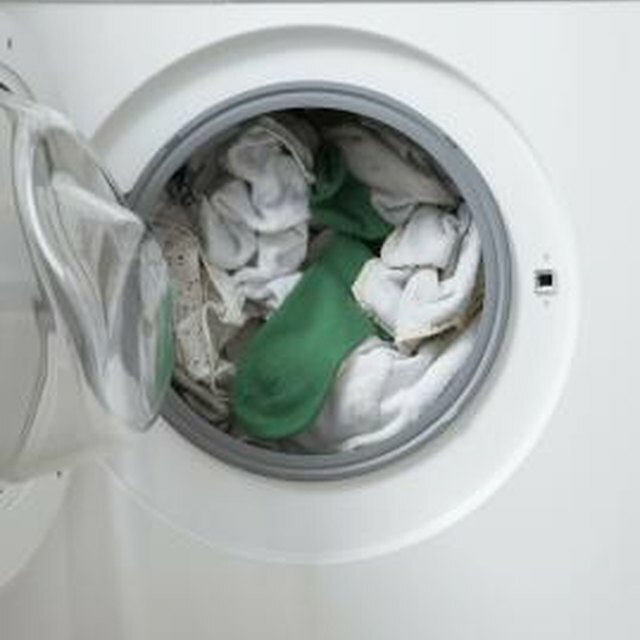 Aside from the obvious purpose of preventing lint buildup on your clothes, a washing machine lint trap prevents the drainage issues that could occur when lint builds up in your washer’s drainage hose. Each time you wash a garment, it deteriorates slightly, leaving behind small pieces of lint. In general, however, “lint” is a catch-all term that includes loose clothing fibers, hair and other debris that comes off your clothing during washing and drying. Over time, lint can build up in your drainage hose if you do not use a lint filter, resulting in drainage problems. In addition, damp lint that becomes trapped within the machine itself due to improper filtering encourages the growth of mold and mildew and can cause foul odors. As all washing machines vary, so too do those machines’ lint traps. Lint traps range from cylinders to nets and hose caps. While many washing machine lint filters are made of plastic, cloth and even metal lint filters are available for purchase depending on the type of washing machine you own. If your washing machine comes equipped with a lint catcher, you must replace it periodically. Not all washing machine lint traps are a permanent fixture of the machine. You have the option to install a disposable lint catcher. Unlike permanent lint traps, you do not need to empty and clean your disposable lint trap. You can simply replace the old lint catcher with a new one as needed. The quality of the disposable lint trap and its manufacturer’s guidelines determine how often you must replace the unit. Although permanent lint catchers are available for washing machines, “permanent” does not mean that you will never need to replace the unit. Over time, even permanent lint traps wear out. How often you should replace a permanent lint trap depends on how often you wash clothes and the type of items you frequently wash. Towels, for example, typically generate more lint than everyday clothing. On average, a permanent lint trap should last from 9 months to one year before it needs replacing. Your washing machine will function just fine without a lint trap, but a functional washing machine lint catcher is a must if your washing machine drains into your septic tank. Lint buildup from washing machines can accumulate rapidly in your septic tank, causing septic system failure. Repairing a damaged septic system could cost you thousands of dollars, making a lint catcher for your washing machine a wise investment. Why Is My Maytag Dryer Making My Clothes Smell Bad? How Far Can You Run the Dryer Vent Hose?